· Cricut Machine – mats, spatula, etc. 1) Start by removing backing from frames, removing glass and anything else that is in the frame. You want the bare frame. You will be using ALL of the shadow box frame contents, so do not throw anything away at this point. 2) Spray paint entire surfaces of the 2 frames and set aside to completely dry. While your frame is drying you can prepare the remaining portions of the project. 3) Using your Cricut machine and “Pagoda” cartridge, cut out 3 - on your vinyl. 1 at 14” and 2 at 11”. The location on your keypad for this design is THIRD ROW DOWN, THIRD KEY FROM THE LEFT. The size of your design will vary depending upon the size of your frames. 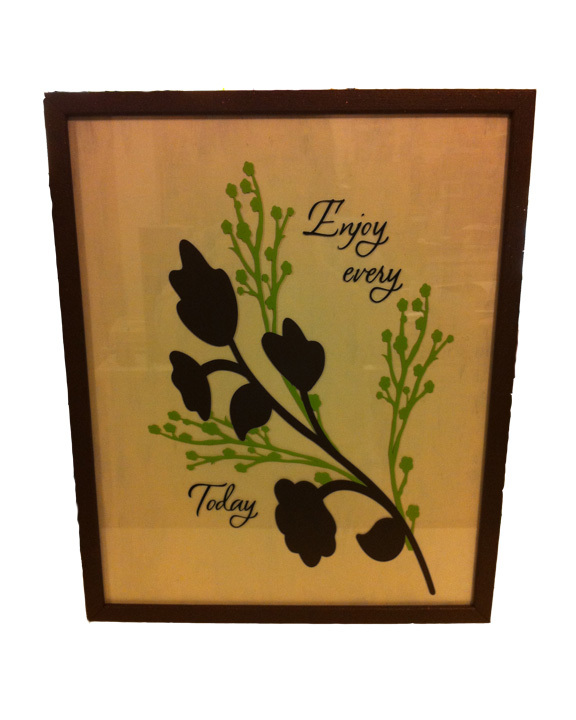 If you are using the 16X20 size frames, then the size indicated will work for your project. 4) Next cut, from vinyl, will be 5 - . Cut 1 at 14” and 4 at 6”. The location on your keypad for this design is THIRD ROW DOWN, NINTH KEY FROM THE LEFT + SHIFT KEY. 5) Weed out your vinyl, press transfer tape onto all designs, burnish with bone folder, peel back and apply LARGEST shapes to right lower corner of your FRAME GLASS. Burnish and carefully peel back the transfer tape. NOTE: Apply your branch designs before you apply your flower design. 6) Cut out a thought or words of inspiration and add them to the glass where desired. 7) There is a large chipboard backing that comes with each frame. Use the acrylic paint and paint brush to paint one of them. You do not need to cover it completely. You can abstractly paint it for a “white-washed” look, as we did in the picture. Set aside to dry. 8) Once the spray paint has dried on your frames, secure them together using 3 decorative hinges. NOTE: You want to join the frames together so that BOTH of the front sides are UP. So in other words you are joining the frames in the same order you would find them stacked on a shelf in a store. You may want to spray paint these if the color of the hinge does not blend well. 9) Add your magnetic closure to the right, insides of the frames. 10) Add glass back into the top frame. Place your painted chipboard in next…painted side visible from the front. Next place one of the cardboard shadow box forms inside. 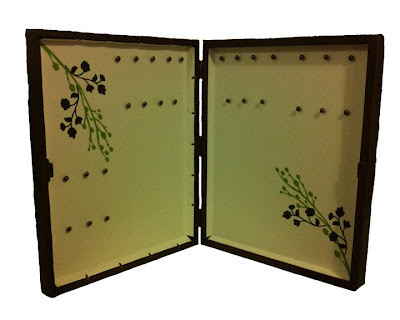 Now, you will bend the frame tabs in and over the form to secure everything in place. You can touch up any areas that need to have a little paint added. 11) In the bottom frame place the cardboard shadow box form and then the chipboard behind. Secure in place with provided tabs. 12) Add smaller vinyl branches and flowers to one corner of each cardboard form (insides of frames). 13) Decide where you want your jewelry hooks to be and how many. Measure out and mark lightly with a pencil. 14) One by one, dip each tip of the upholstery nail into the E6000 and poke into the cardboard form. DO NOT push all the way in. Leave a good size space between the head of the nail and the form. Let dry over night.